Felted-wool stars and circles add color, texture, and depth to this cottage pillow. The black flannel works beautifully with the wool to provide a warm and cozy feel. 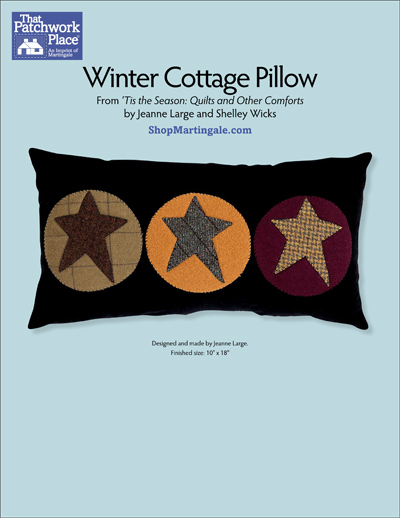 Create this eye-catching pillow for someone special--including yourself! Finished size: 10" x 18"
Shelley has been quilting for well over 20 years, having started when "quilting wasn't cool!" Both her grandmothers quilted in different styles and each passed on her knowledge and love of quilting. Shelley lives in beautiful Moose Jaw, Saskatchewan, Canada. 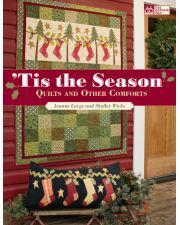 When she's not busy designing, quilting, working at The Quilt Patch, or walking a trade show, she enjoys shopping, home decorating, reading, and if there's still time left over, working in her yard. Jeanne learned to sew as a young girl from her mom and her Auntie Alice. She grew up sewing garments for herself, and then moved on to sewing for her five children, often creating something original and unique. 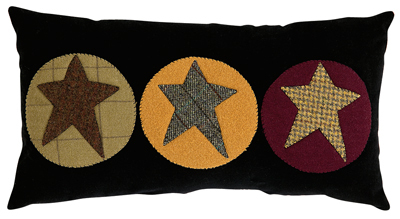 Quilting was a natural progression from garment sewing and continues to fill a need to create. Time to spend on other hobbies, such as basket weaving and woodworking, is becoming rarer as the number of grandchildren grows and work commitments increase. However, there is always time to sew.